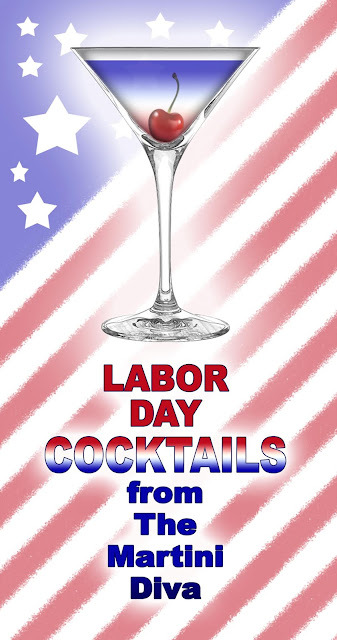 Personally, I think it was invented by a overworked, under appreciated, bored and hungover mid-twentieth century housewife who spied a nearly empty bottle of vodka on the kitchen counter the morning after she and her hubby had thrown a cocktail party. "Waste not, want not" and that dribble of vodka went into her morning o.j. before the bottle went into the trash can. From that point on a little vodka in the juice was as accepted an accessory to her breakfast as her pearl choker was to her shirtdress. 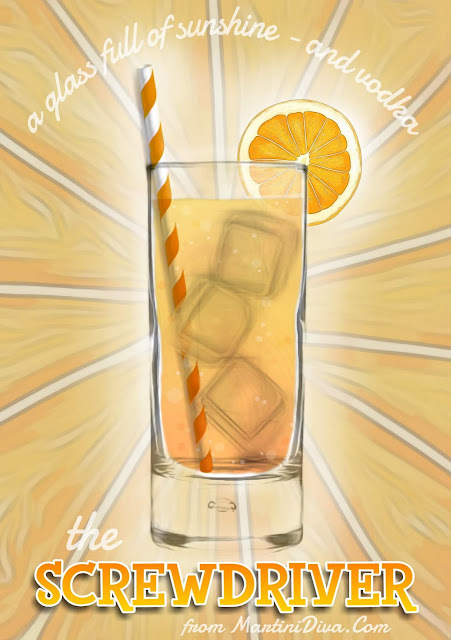 The I.B.A recipe calls for 10 parts orange juice to 5 parts vodka. I like my Screwdriver a little less like diesel fuel and fresh juice is a must. 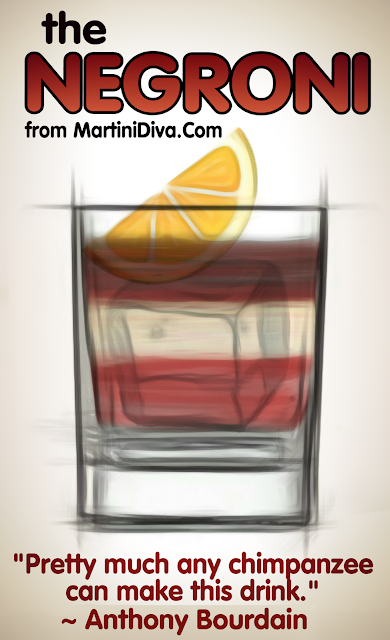 DIRECTIONS Fill a chilled highball glass with ice cubes. Add the vodka, add the orange juice, stir. Garnish with an orange slice, serve. National Screwdriver Day is December 14th. DIRECTIONS * Make some homemade Pico de Gallo. After it sits for several hours or overnight there will be some lovely juices you can strain out. How much juice will determine how many cocktails you can make. Chill your glass. 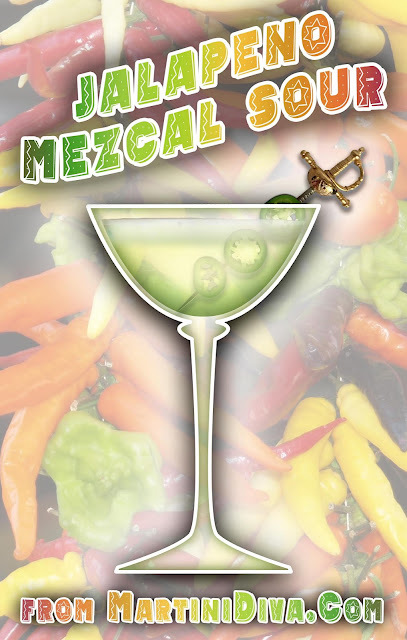 Add the tomato vodka, pico de gallo juice and lime juice to an ice filled cocktail shaker, shake until chilled then strain into your chilled glass. Garnish with a sprig of cilantro and a lime slice then enjoy. 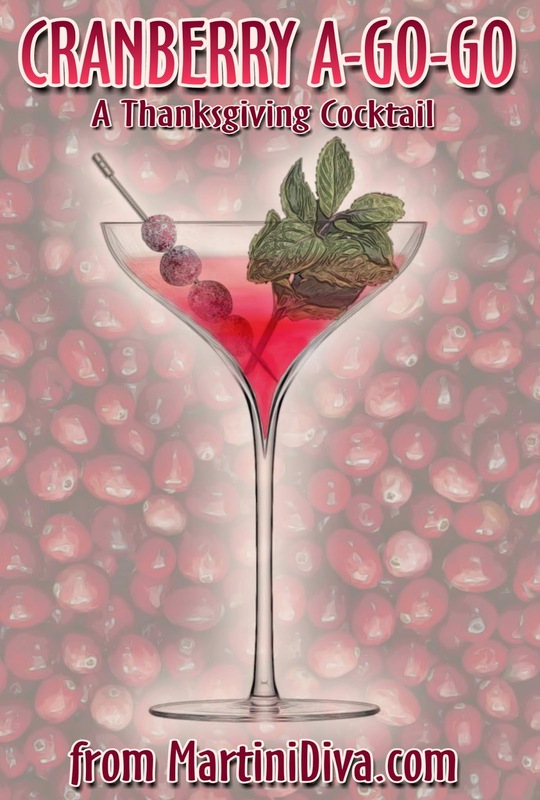 The fruit most associated with Thanksgiving and the holidays is probably cranberries and it's also the time of year where it's easy to get them fresh so it follows that it's also a great time of year for cranberry cocktails. 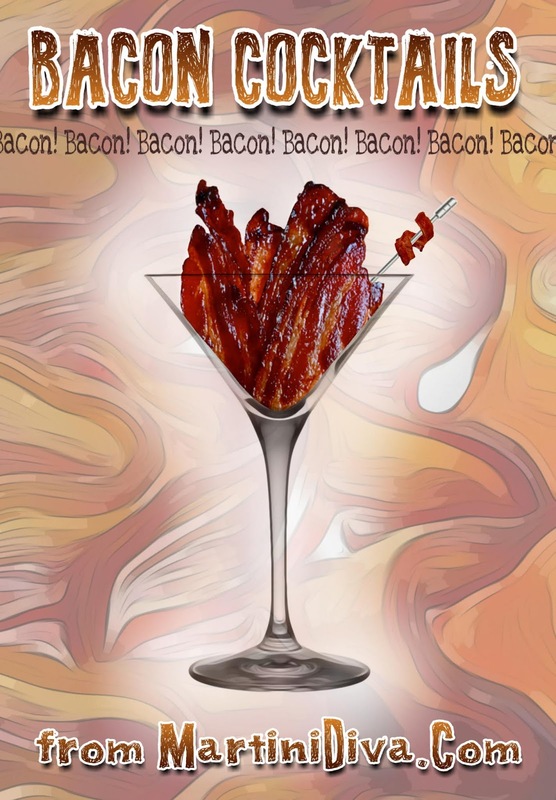 Add a little Jack Daniels, some lemon and sugar and you're ready to (pardon me for this) a-go-go. DIRECTIONS Make your sugared cranberries and set aside. Warm the lemon juice then stir it with the turbinado sugar until the sugar dissolves. 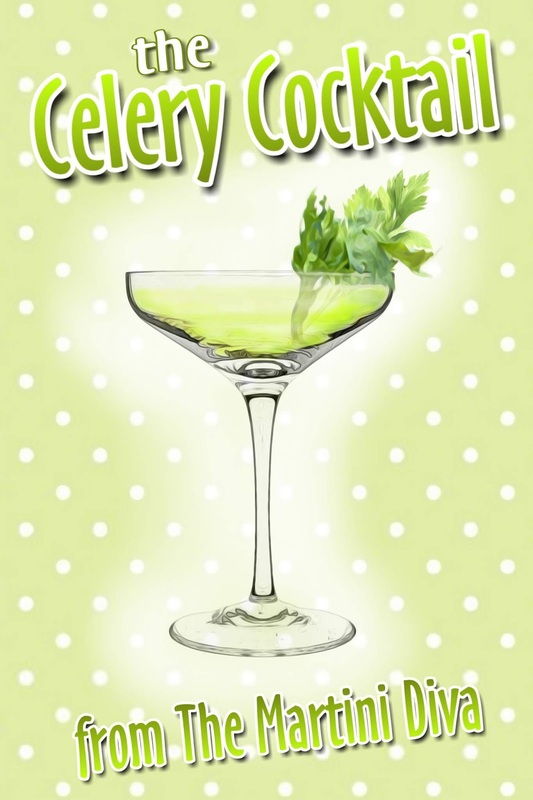 Muddle the sugar and lemon juice with the mint in the bottom of your cocktail shaker. Fill your cocktail shaker with ice Pour in the whiskey, cranberry liqueur, and cranberry juice. 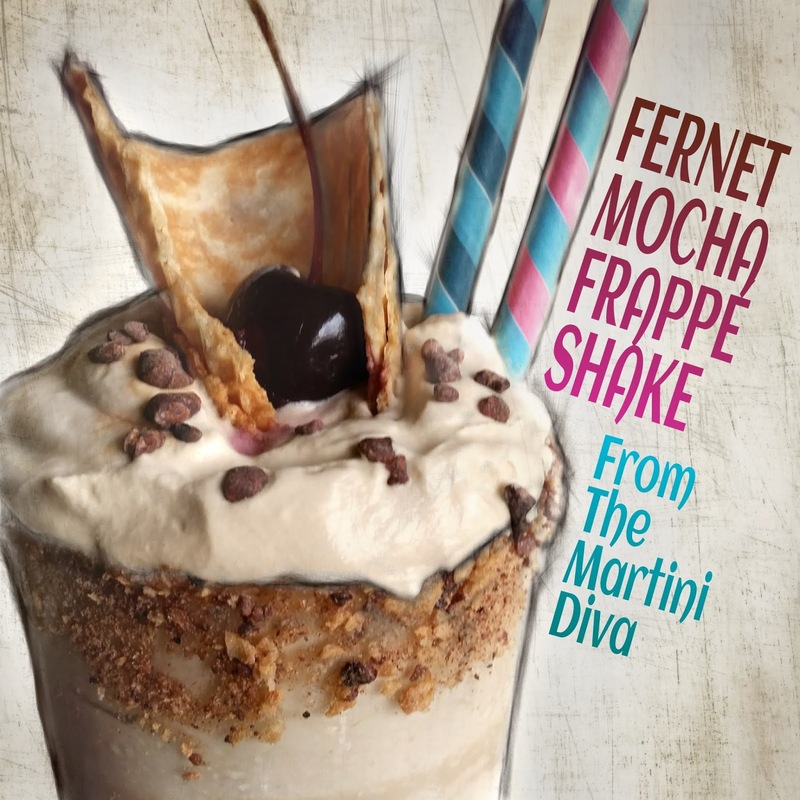 Shake until chilled then strain into your chilled glass. Garnish and serve. 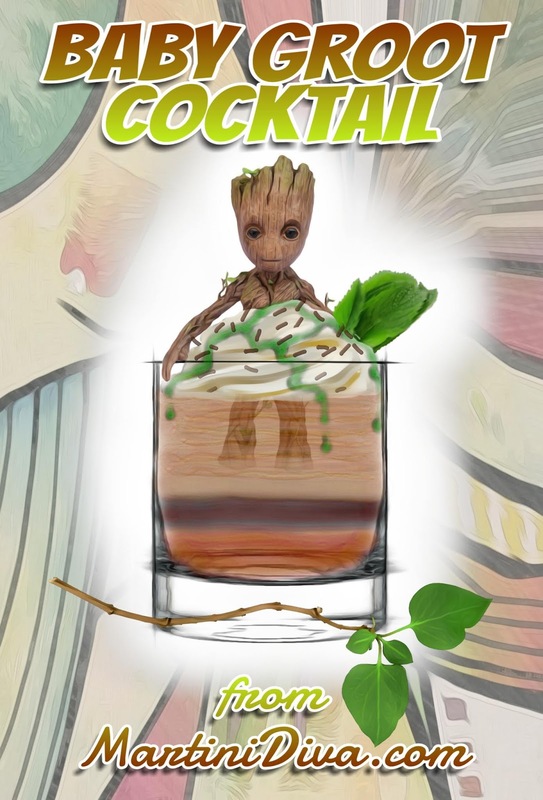 This drink is one of the top favorites of all my Halloween Cocktails, most likely because it comes garnished with a gummy eyeball and people love telling their guests it's a Slimy Eyeball Martini. It tastes pretty good too. 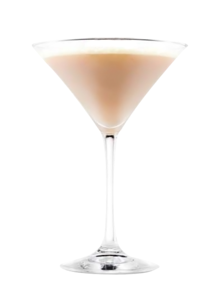 However, I created this one years ago and it originally had cream in the recipe which added nothing to the flavor and clouded the drink thus hiding the whole point - the eyeball. That has bugged me for a while now so I'm fixing it. I also added a bit of Blue Curacao to give it a creepy green color. Nothing says Halloween more than a weird colored drink with an eyeball in it. 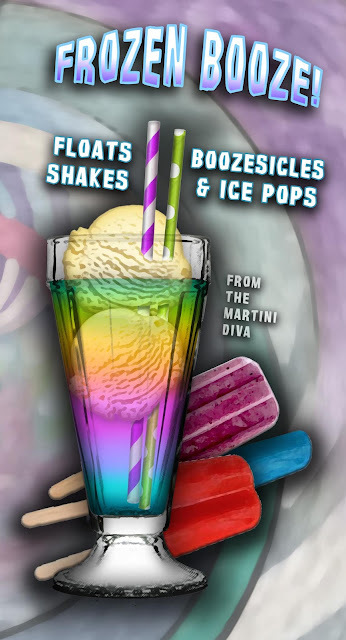 Pour the vodka, Sunny Delight, Blue Curacao and rum into your cocktail shaker with ice and shake until well blended and chilled. 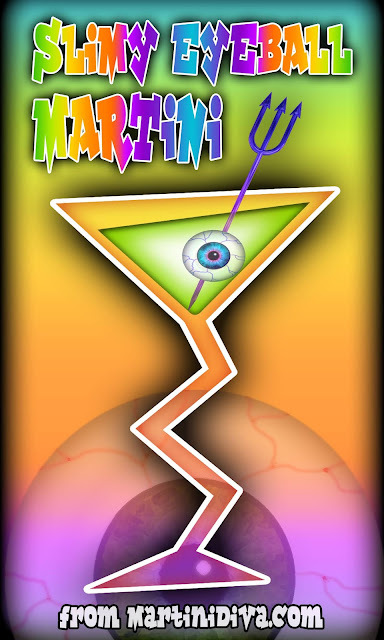 Strain into your chilled martini glass, skewer the gummy eyeball on a cocktail pick, drop in and serve. 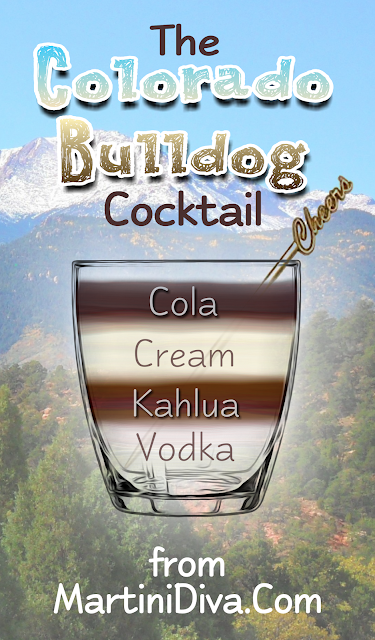 Add all ingredients, except the bitters, to a cocktail shaker - without ice - for a vigorous dry shake. 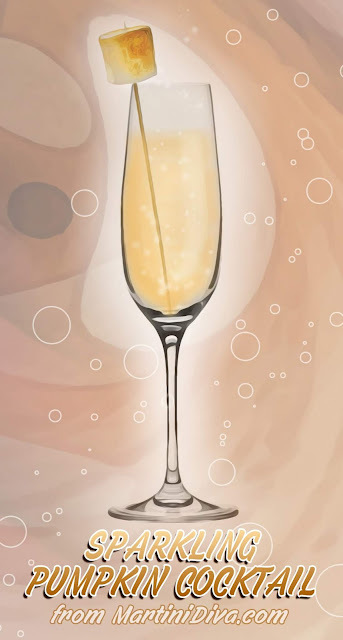 Strain into a chilled cocktail glass, tap on the orange bitters, garnish and serve. Using gloves, strip out the seeds and placenta (white pith) from the roasted jalapeno pepper then cut into several thin strips. Do not touch your eyes or other sensitive areas while handling the peppers. Heat the sugar and water on medium until the sugar has completely dissolved. 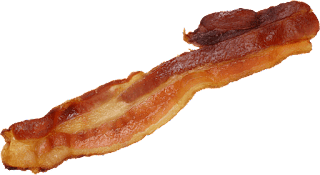 Still using the gloves, toss the jalapeno strips into the syrup, bring this to a boil on medium, then lower the heat and simmer for 10 - 12 minutes. Remove from the heat and allow the peppers to infuse into the syrup until it's cool. 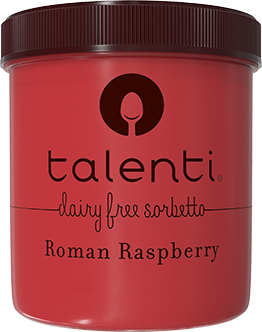 Strain then store in airtight glass jar or container in the refrigerator for up to two weeks. Despite the fact that it's Labor Day, it's still in the 100s here in Tucson, so ... how about one last summer cocktail before fall grabs hold of the weather? DIRECTIONS Cut the strawberries into quarters then drop in the bottom of your glass. Drizzle the honey over the top of the strawberries. Muddle until the strawberries are well smashed. Fill your glass with ice. Add the whiskey then top off with the Henry's Hard Lemon Lime. Stir gently then garnish and serve. P.S. If you don't like the idea of the chunky strawberry pieces, puree the strawberries with the honey in a blender instead of muddling them together in the glass. PRICKLY PEAR OLD FASHIONED RATTLED SKULL RED WOMAN'S BERRY WINE PUNCH SPICED APPLE OLD FASHIONED SPICED RUM POMEGRANATE FIZZ STRAWBERRY JAM OLD FASHIONED TIJUANA JACKASS AFTER LABOR DAY PREPARING YOUR BAR FOR FALL Labor Day passes quickly so below are a few tips to get your fall happy hour on as summer fades and Old Man Winter is breathing down your neck. 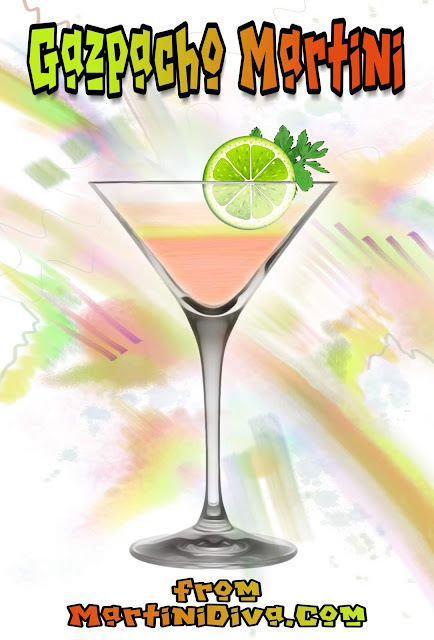 Of course, a good host or hostess should always be prepared to serve a guest that Pina Colada or Tom Collins if that is what they desire, but getting into a seasonal aspect at happy hour keeps you and those you're entertaining from cocktail boredom. Take the last of your summer produce and herbs and turn them into simple syrups or shrubs. 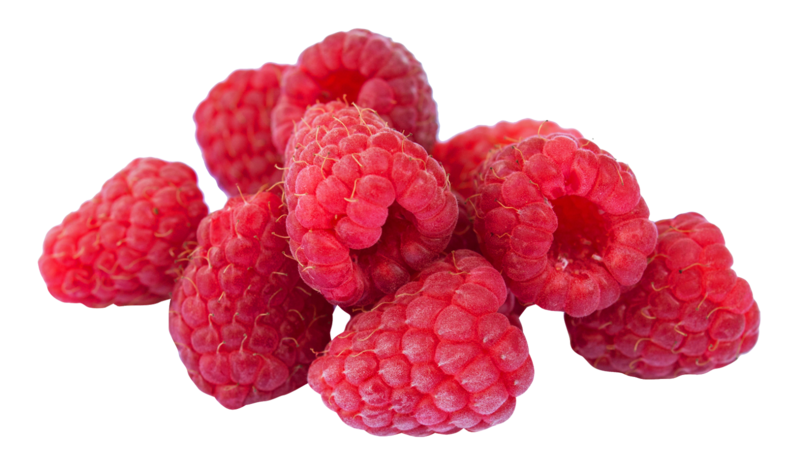 Even jams and preserves can be used in fall and winter to replace fresh fruit and sugar in your cocktails. Fill your cocktail shaker with ice then add the ingredients and shake until well chilled. 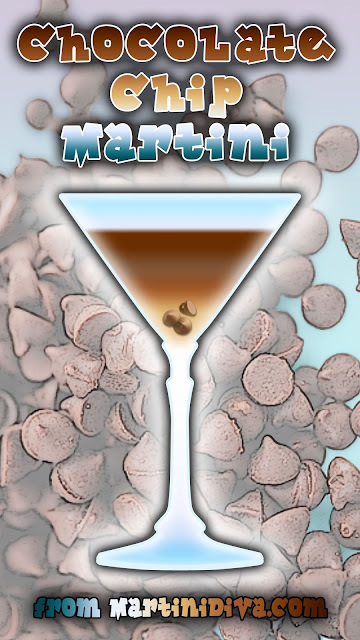 Strain into your chilled glass then place a few chocolate chips on the rim and serve. 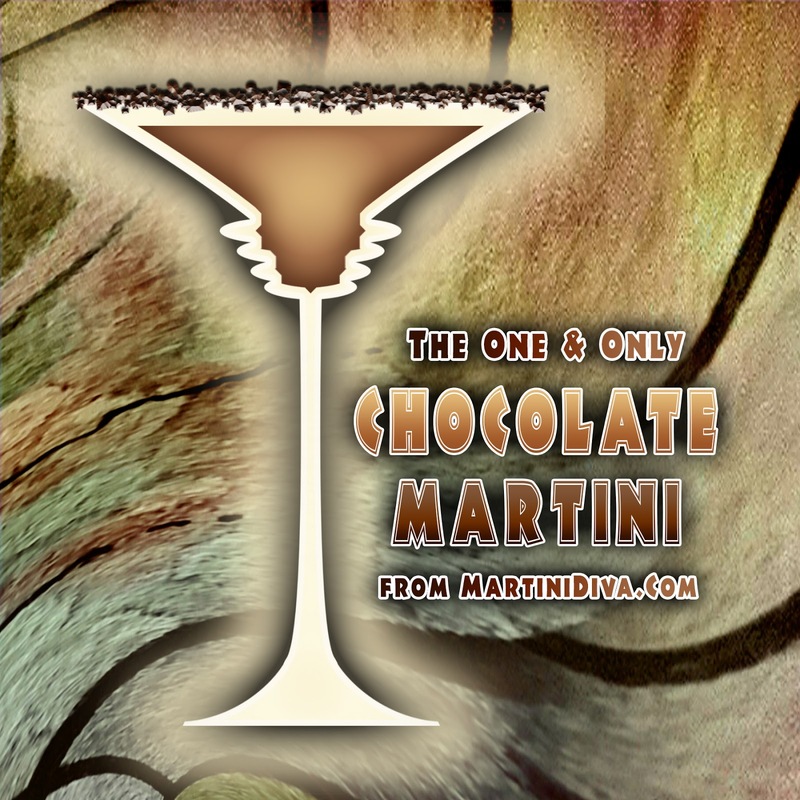 How to make your own Chocolate Vodka. National Chocolate Chip Day is August 4th. 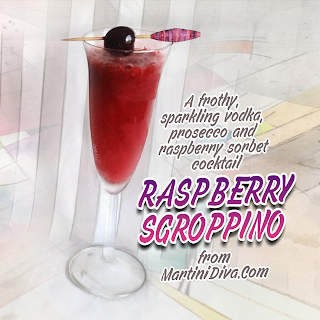 Once upon a time, on a very, very hot summer day I wanted a cocktail so cold that I joked I needed a Cocktail Popsicle. 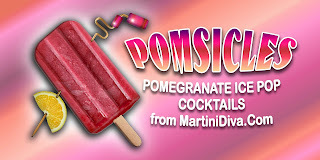 I liked that idea so much I made myself some Pomsicles. 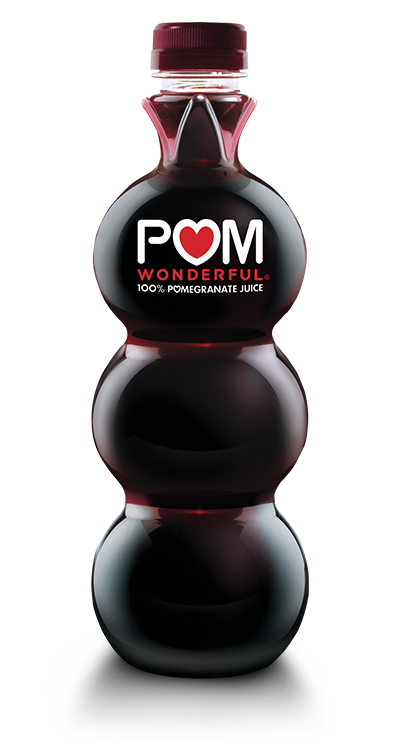 It was pretty easy since I had a huge bottle of Pom Wonderful in the fridge as well as Pama Pomegranate Liqueur and Pomegranate Vodka. I took the opportunity to dip a few in chocolate "magic shell", an ice cream coating that solidifies when it hits something very cold, like ice cream or popsicles. I love chocolate and fresh fruit together, I wasn't going to miss that opportunity. Pour mixture into the molds, leaving a little room at the top for expansion as the liquid freezes. 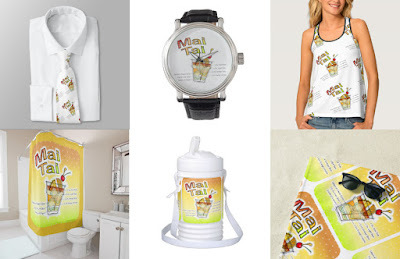 Wipe off any spills or drips so they won't cause the ice pop to stick in the molds. Pop in the freezer overnight. (If you are using molds that require adding wooden popsicle sticks, freeze the pops until partially frozen - about three or four hours - then slide the stick gently into the center of the pop. If the stick stands on it's own you can then continue to freezing the pops overnight. To remove the pops from the molds simply dip them in a bowl of warm water or just let them sit out for a few minutes before removing the ice pop from the mold. Just before eating or serving, if you like the chocolate coating idea, pour some of your Magic Shell into a glass then dip in the tops of your Pomsicles. I like to remove my Boozesicles™ from the molds, pop them in individual plastic baggies and refreeze for an hour before serving. They seem to solidify a bit better and they can be kept in the baggies for several weeks as well. 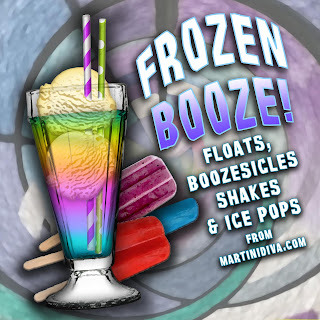 Summer is here and it's time for some frozen booze! 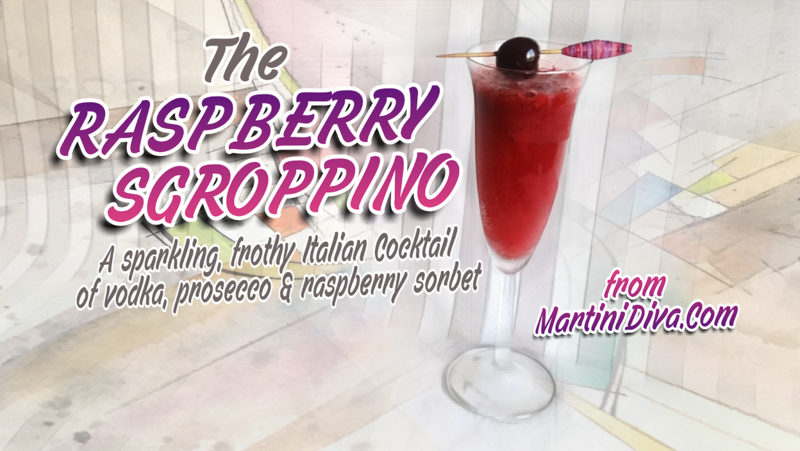 When the blistering heat waves roll in it's time to find a cool way to chill down at the end of the day and these chilled out cocktails will do the trick. 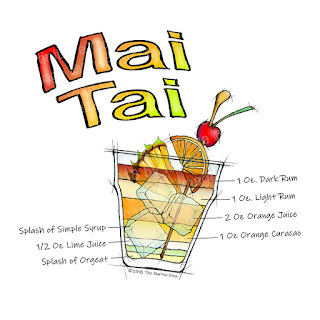 A full color illustration of the famous double rum Tiki cocktail, the Mai Tai. The drawing shows a rocks (old fashioned) glass filled with ice and each ingredient portioned out according to the cocktail recipe ratios. The cocktail rendering includes garnishes of a Maraschino cherry, an orange slice and a pineapple wedge. 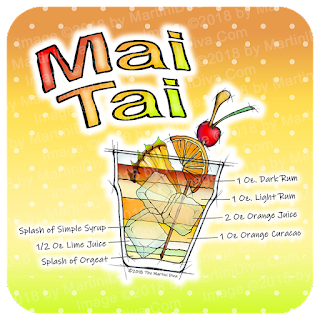 The drinks name Mai Tai, curves across the top, the recipe ingredients are alongside the cocktail glass. The background is a graduated deep rust to lime green with white polka dots. Primary colors: deep red, rust, peach, orange, cream, chartreuse, lime green. 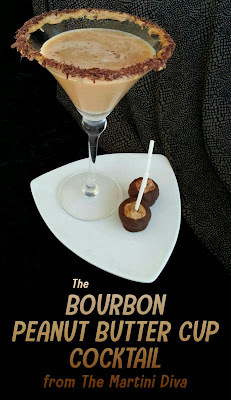 Perfect for happy hour entertaining, cocktail parties and events, bar decor and family entertainment rooms as well as birthday, bachelorette and bachelor parties. 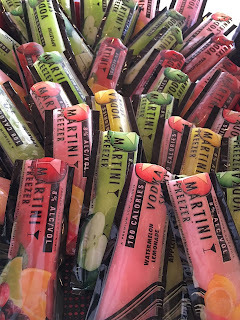 Have you seen those low calorie boozy "Vodka Martini" type ice pops showing up in Costco and other places? 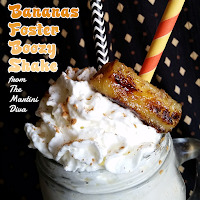 They are a great idea for summer cocktail hour and parties; they're icy cold, refreshing and low ABV (alcohol by volume), which is very popular now and a good idea for hot temperatures. But, at only 100 ml. each (3.4 ounces), they're pricey and it will take a few of them to equal one typical cocktail. They sell for around 3 bucks each and are loaded with artificial coloring, flavoring and sweeteners. Furthermore, at less than 4 ounces each with an 8% ABV, how many would your happy hour guests slurp down at 3 bucks a pop? You know what I say about that? DIY BABY! You can have healthy, refreshing ice pops galore, and at a price that won't offend your wallet. Each one of the 100 ml. 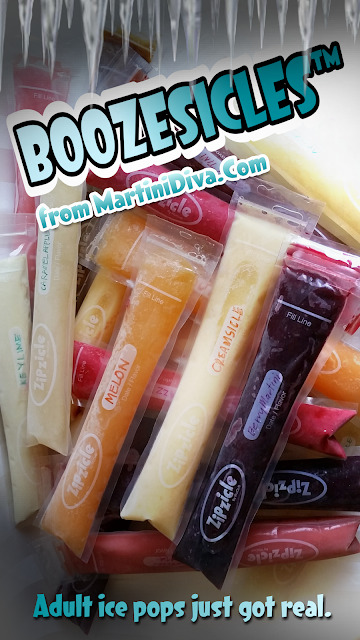 (3.381 ounces) "vodka martini" pops are 100 calories. Homemade 100 ml. 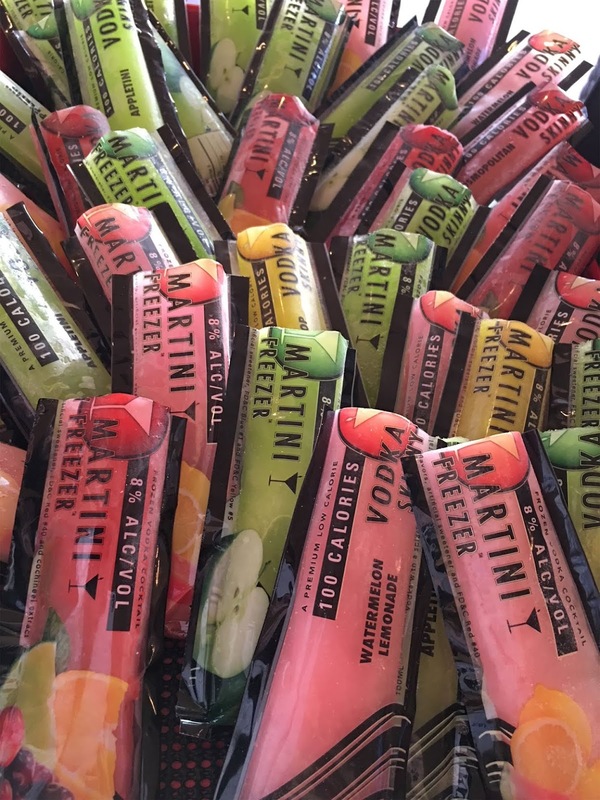 cocktail ice pops using fresh juices and purees will end up at or under 100 calories, BUT without the artificial sweeteners, flavors and colorings. If your mixer is tea or coffee that should be even lower. 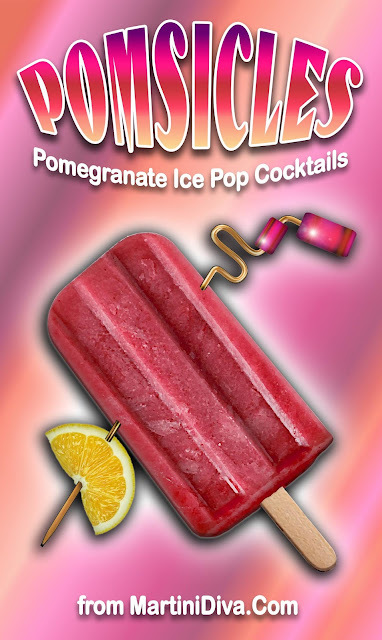 That gives you the same or a lower calorie count of the pre-packaged ice pops but without the artificial ingredients. BINGO! 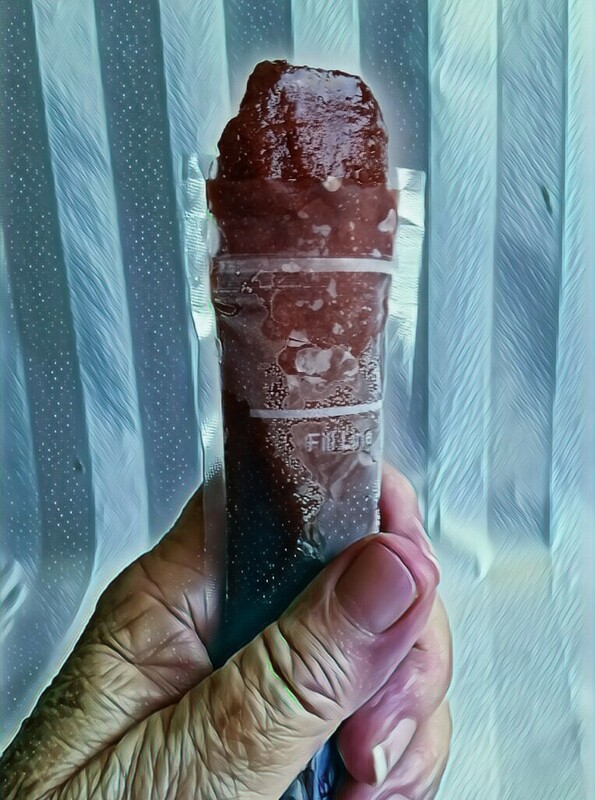 HEALTHIER, HOMEMADE BOOZESICLE™ ICE POPS that are still low in calories and also meet the popular lower ABV cocktail trend! 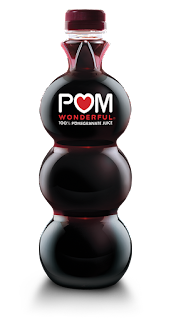 Because these cocktails are eaten, you can also use a fresh fruit puree instead of a juice and, because the puree includes all the pulp, each homemade ice pop is full of even more vital nutrients and fiber. 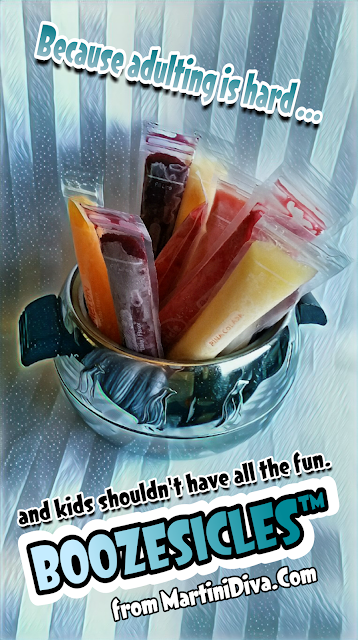 Homemade alcohol infused ice pops are easy, a lot of fun to make and your choice of frozen cocktail flavors is endless. TOOLS Zipsickle style ice pop freezer bags. I ordered mind on Amazon. Mixing pitcher, shaker or glass. Funnel. BASIC ICE POP DIRECTIONS 1. Add in 1 part of decent but reasonably priced 40% or less ABV spirit and/or liqueur. 2. Then add in at least 4 parts of a non alcoholic liquid like fresh juices or purees, tea, coffee, yogurt. Feel free to add in a splash of lime or lemon juice to brighten things up. 3. Freeze overnight. 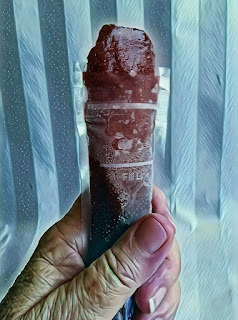 I was not so concerned about calorie count as I was about creating healthy, delicious ice pops and used a few things like bitters for complexity and to balance sweetness. I also used homemade grenadine, flavored vodkas, cream of coconut and flavored yogurts to sweeten without adding sugar. However, the bitters were only a dash or two and have almost nil calorie count, the flavored spirits were already accounted for in the liquor ratio and the sweeteners like grenadine or cream of coconut were only around a teaspoon per pop. CREAMSICLE: Orange Vodka, Fresh Orange Juice, Vanilla Yogurt. 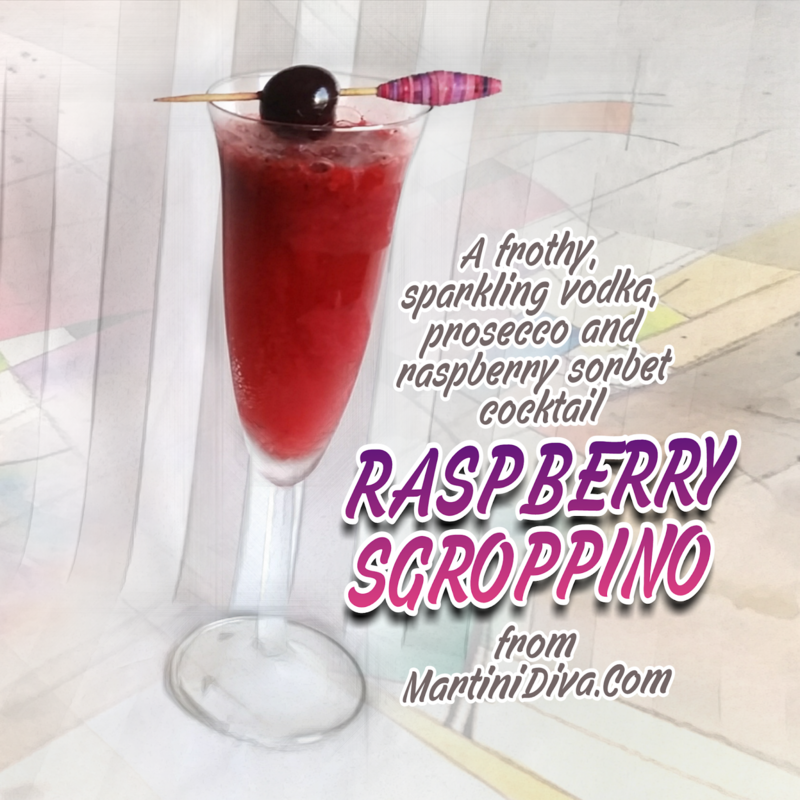 DREAMSICLE: Whipped Cream Vodka, Fresh Raspberry Puree, Vanilla Yogurt. 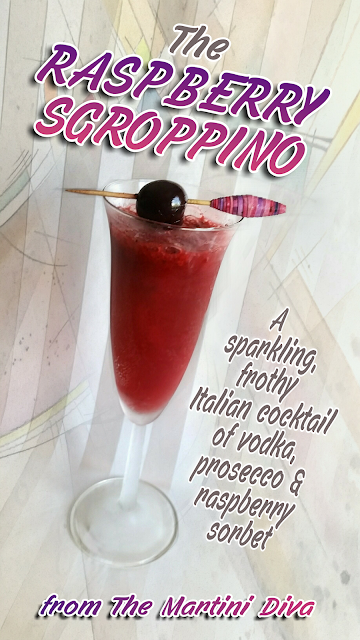 SPICY WATERMELON: Watermelon Vodka, Watermelon Juice or Puree, Lime juice, Dash of Hot Sauce. STRAWBERRY SUNDAE: Strawberry Vodka, Strawberry Puree and Vanilla Yogurt. 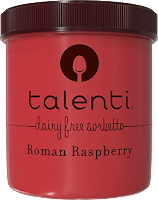 You can play with the flavors to suit your taste and just multiply the ingredients to make batches of the each flavor. * I even made a pile of booze free ones for the children where I just left out the booze. 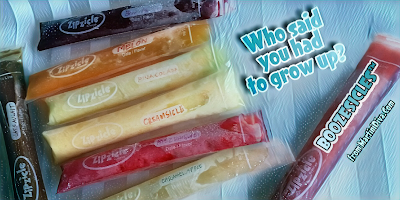 I used some natural food colorings to make the kiddies ice pops in blues, purples and greens to make sure the parents could be sure no little ones got a buzz on. 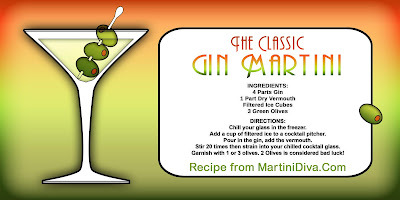 What is a classic martini recipe? Ask a thousand people, you'll get a thousand different versions of the original martini recipe. 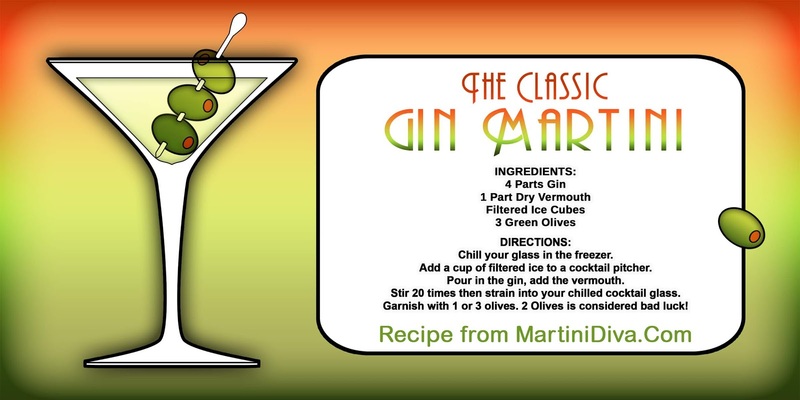 Make no mistake, the real, classic martini is a gin martini. 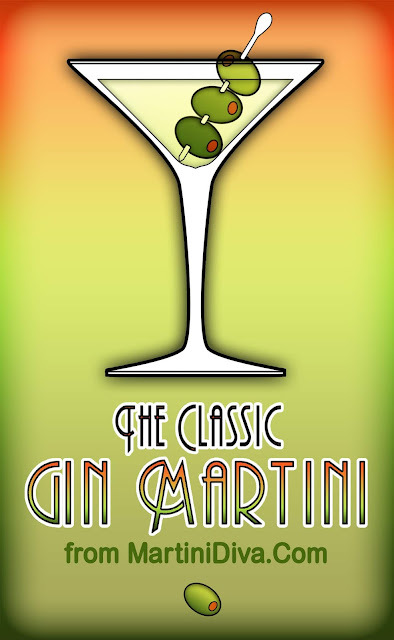 I don't mean to offend you vodka proponents but gin was the spirit used in the original martini way back in 1911 and is still considered essential to a "real" martini. Folks will argue until doomsday about ratios of gin to vermouth, whether to stir or shake, over or up, liquor brands and every other single part of the cocktail and it's mixing process. 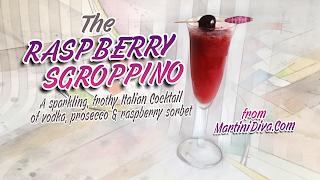 The martini is such a very personal drink it's an age old debate at the bar. But one thing about the vermouth amounts ... if there's no vermouth at all it's not a martini. It's just gin. Got it? 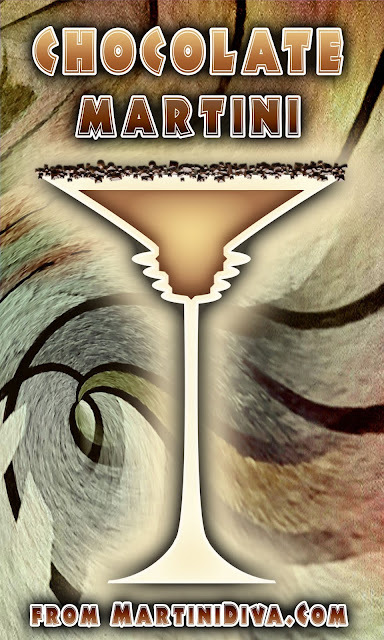 Once upon a time I was not a true martini lover. I loved the glass but I was not ready for gin. 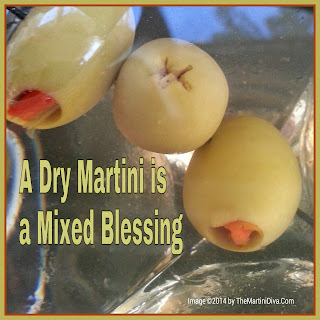 That has changed, a lot, and I happen to adore gin and gin cocktails these days, including the martini. 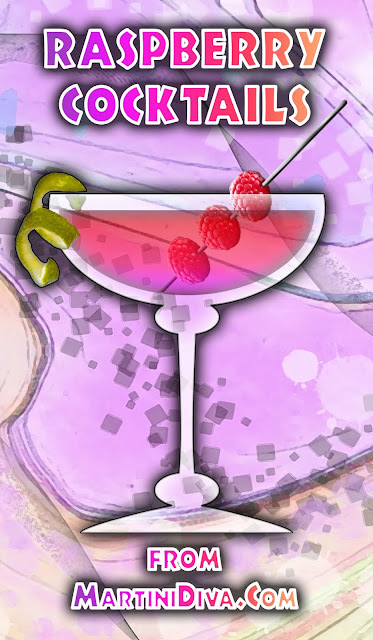 Gin and martinis are both acquired tastes. I have acquired them. 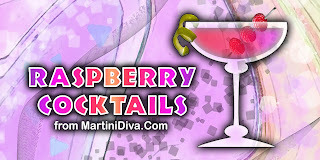 I have also played around with the recipe myself quite a bit and love Dirty Martinis, Smoky Dirty Martinis and hundreds of cocktails I have designated as "designer martinis", but if someone asks me for a martini with no additional provisos this is the cocktail they will get. 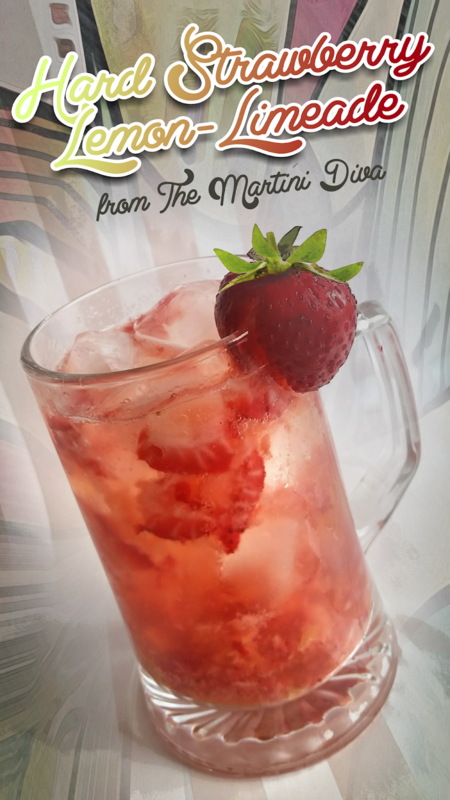 Chill the gin, chill the glass, chill the pitcher. 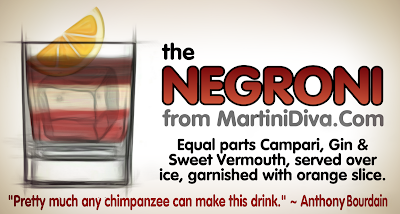 The vermouth should already be in the fridge! Fill a chilled mixing pitcher with filtered ice. Strain into your chilled glass. Garnish with 3 honking green pimento olives. IF YOU PLAN A TOAST TO THE LATE ANTHONY BOURDAIN TONIGHT, THIS IS THE COCKTAIL YOU SHOULD BE DRINKING. 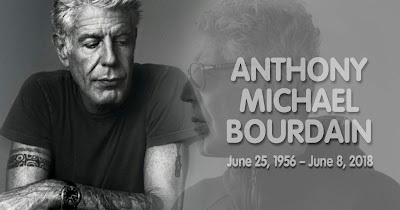 I woke up this morning to the tragic news that chef, author and travel guru Anthony Bourdain had died. Shocked and terribly saddened, I went on to discover he had died by his own hand, which drove me deeper into my sadness. The loss of someone you admire is difficult and it is made more so when you discover they took their own life. My heart goes out to his family and his close friends. At the top of my personal Bucket List was the hope to meet, and maybe even dine with, Mr. Bourdain. It probably was never going to happen, now it never will. I admired his outspoken view of the world, his honesty and the way he embraced life and will miss checking his Twitter feed to see who or what he was currently taking to task. 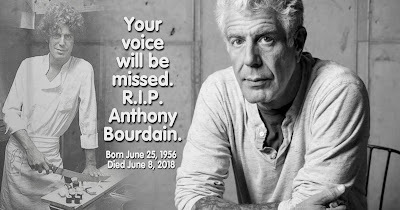 I'll miss not having new episodes of his gustatory travel adventures and his nearly always controversial appearances and talks elsewhere. 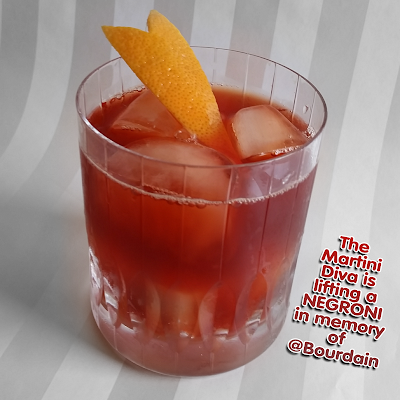 Anthony Bourdain was the rock star foodie who showed us how to globally drink and eat and one of his favorite cocktails was the Negroni. Tonight I shall lift a glass and toast a gentleman who, on a daily basis, made me laugh, made me learn and made me question myself and the world around me. 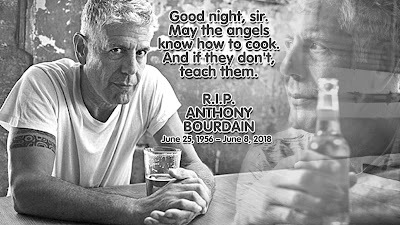 I will say cheers and goodbye to a unique individual I came to admire in the years since I first read his book No Reservations and I will do so with a Negroni in hand. Pour ingredients over ice in a chilled glass.